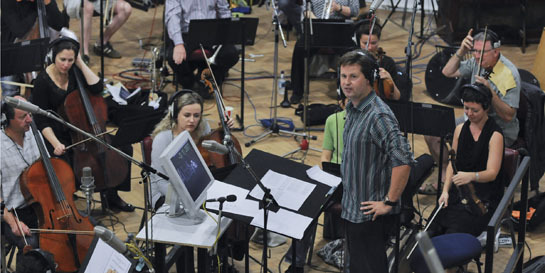 Last Sunday I was lucky enough to be invited along to the famous Abbey Road studios to see the London Philharmonic orchestra putting the final touches to the 205 national anthems being recorded in preparation for London 2012. The corridors at the studios are lined with pictures of some the greatest recording musicians of all time and vintage recording equipment litters all available space. There is something truly magical about the building. The orchestra were in full swing when I entered the control room of studio two which over looks the vast recording space below. The musicians spent over 50 hours in this room to complete the project. The sheer scale of the track allowed only 12 minutes to sight read and record each anthem. Lots of tales were told throughout the day by composer and conductor Philip Sheppard including interpreting the anthem of Bhutan from a recording of a man singing in a temple, the only version he could find. Each of the anthems has to be approved by the nation’s sporting associations. ...who helped the percussion section with some of the recordings .